How do you choose the best for you from so many book publishing companies? When you write a book, the most difficult decision you will have to make is deciding on your best book publishing option. For first time authors, it can be a daunting process because of the enormous range of options available. More importantly, what are the most reputable publishing companies, and which book publishing companies can you trust? What are your safest choices? I can vouch for many of the following companies from either having used their services myself for many years or from positive feedback from fellow authors. All of them provide free or mostly free self-publishing services of the highest standard. For companies that I have not personally used, I will give you a recommendation from The Alliance of Independent Authors (ALLi). The most popular self-publishing service providers are online retailers. All of these well-known companies offer easy, free ebook publishing, and some offer low-cost print on demand paperback publishing. All of them are trusted names, but because they are big companies, there is very little support available. However, for most self-publishing authors all of them offer a safe, secure, streamlined and straightforward publishing process. These companies also offer a high royalty percentage of between 60-70%. Amazon KDP is by far the largest and most popular self-publishing platform in the world. It is also the biggest seller of ebooks and books by a huge margin. If you are publishing for the first time, there is no doubt that KDP is the best way to make your book available for sale online. There is no doubt that Amazon sells books and a lot of them. You can choose from two options when you use KDP to publish ebooks. You can choose standard KDP or KDP Select. You can read more about these two choices in our article; The Pros And Cons Of Amazon KDP Select Exclusivity. You can publish Kindle ebooks very quickly and easily. However, if you plan on selling books in paperback format with Amazon, you will need to understand a little about book formatting. For many years, Amazon used CreateSpace for this purpose. However, Createspace has now been merged into Amazon KDP. If you have basic technical skills, it is not difficult to publish a paperback of acceptable quality using Amazon KDP. Apple is a clear number two in the ebook market. Again, you will be publishing with a very big company, so there is no personal assistance available. However, if you follow the help pages and FAQs, you should have no difficulty in publishing your ebook and making it available to Apple users. Formerly known as Nook Press, B&N Press offers an easy way to self-publish. However, its book market is mainly in the United States, unlike Amazon and Apple which are both worldwide. More often known as Kobo Books, it is an online publisher and retailer that also sells reading devices to its customers. It has a small share of the global market, but it can generate ebook sales for independent authors. Similar to Apple, there is the choice to self-publish directly with Kobo or to use an aggregator. An aggregator is a publishing service that you can use to make it easy to make your ebooks available on many online ebook retailers. It is a simple process to self-publish your ebook, and then you can choose from a large selection of retailers. Your royalty rate will be slightly lower than if you publish directly with retailers. But the convenience of publishing once and then automatically setting up distribution to many retailers is worth the very small reduction. Smashwords has been in the ebook business for a long time. It has excellent customer support. When you self-publish with Smashwords, you can make your ebook available on a long list of ebook retailers and lending libraries. Many authors chose to publish in ebook format on Amazon, and then use Smashwords to publish and distribute their ebooks to Apple, B&N, Kobo and many others. Draft2Digital (D2D) offers a very similar service to Smashwords. Again, its customer service is outstanding. I must admit that I prefer D2D for one reason. If you have a number of titles, D2D has an automatic end matter function. It means that when you publish a new title or update an existing one, all you back matter is updated and republished automatically. It is a great facility to have if you publish fiction books in a series. Related reading: How Much Does It Cost To Publish A Book Using Self-Publishing? Lulu was one of the earliest self-publishing companies and is a distributor of ebooks and print books. It has its own bookstore but can also distribute to other retailers including Amazon, Apple, Barnes & Noble and Kobo. With Lulu, you can self-publish in hardcover and paperback for print books. Its ebook publishing and distribution services are free. However, it also offers paid support services such as editing and cover design. BookBaby is more of a full-service book publisher. Most of the services, while classed as self-publish are, in fact, pay to use. For new authors who are not confident in their ability to do all the aspects that are required with free self-publishing, these services can be of great assistance. IngramSpark offers similar paid services to BookBaby. It is a full-service publisher that specialises in the worldwide distribution of print books. Again, this company might be a choice for an author who would prefer to outsource the publishing process. Blurb specialises in producing books in many formats. It has a bookstore and offers limited distribution channels. However, its biggest plus is that you can pay to publish and produce high-quality books, which you can then sell. For many authors, their dream is to sign a book deal with one of the major publishing houses such as Penguin Random House, Hachette Book Group, Macmillan or HarperCollins and have a chance to get on the bestseller lists. But it is not an easy road to get published by one of the big traditional publishers. Naturally, though, they are all highly regarded companies and are all highly recommended. If you want to take this publishing route, you will first need to find a literary agent who is willing to represent you. It can be a long and frustrating process of rejections and waiting for replies and complying with complicated submission guidelines. However, if you are fortunate and manage to secure the services of an agent, it will be up to your agent to offer your book proposal to potential publishers. Again, if you are fortunate enough to be offered a publishing contract, it will then take up to a year before your book is published. In some cases, you may be offered an advance, but this is not now as generous as it was in years gone by. The big benefits, of course, are that your publisher will meet all the edit, design and production costs and you will be assured of being paid your due royalties on time and in full. There are many, many small companies online that offer assisted self-publishing services. It would be fair to say that these companies range from the good to the bad to the ugly. I have referred to the Alliance of Independent Authors (ALLi) a few times already in this article. 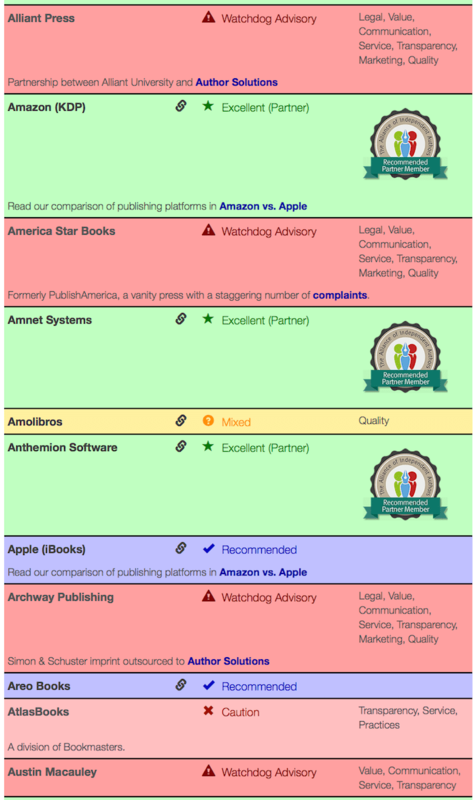 ALLi maintains an extensive watchdog list of the best and worst publishers and publishing services with advisory notes. I would suggest that you bookmark this link for future reference. You can see a small selection in the image below of the ratings for a handful of companies and service providers. If you are thinking about using any small online business to help you publish your book, check this list first. If a company name is in red with an advisory notice, you should be aware that there have been problems reported regarding legal issues, service deficiencies or quality of service. If a company is marked in green and with an excellent rating, you can be reasonably sure that you will receive good service from a vetted company. As you can see from the image, there are many companies that are not recommended. Similar to assisted services, there are some fantastic, hard-working small press publishers, but there are also some that are not so good. Like all new small businesses, many fail within the first two or three years, and that causes huge problems for authors. Very often it means that you have no way to get your book rights back. When you sign a contract with a small press publisher, you will be signing over your book rights, and it will be up to the publisher to pay your royalties. So you need to be very confident that the publisher can fulfil its part of your contract. If you are considering signing with a small press, do your research first and check its ALLi rating. Also, look for companies that have been around for a long while and have a solid track record of success. In my own case, I am signed with a small press publisher to publish my audio books, and I can say that I am completely satisfied. However, I hear of many cases where authors have experienced a lot of difficulties. My recommendation is to proceed with caution. The first point to make here is that vanity publishing is definitely not self-publishing. Vanity publishers charge a lot of money to produce your book. In other words, they are selling your book to you the author. There have been many complaints and even court cases over the years involving vanity press publishers. If you receive an unsolicited offer to publish your book, beware. Here are some well-known vanity publishers that you should avoid. Archway Publishing, Author Learning Center, AuthorHouse, AuthorHouse UK, AuthorHive, Balboa Press, Balboa Press UK, Booktango, GABAL Global Editions, iUniverse, LifeRich Publishing, Palibrio, Partridge Publishing, Partridge Africa, Partridge India, Partridge Singapore, Trafford Publishing, WestBow Press, Wordclay and Xlibris. You should take extreme caution if you are considering publishing with any of these companies. I receive spam emails almost every week from SBPRA, even though I never subscribed to its mailing list. I have tried unsubscribing, but without success. As you can see from the alert above, it currently owes $125,000 to authors, so it is a company you should avoid at all costs. As you can see from the warning above, this is a problem publisher that is the subject of many complaints and also criminal proceedings. Without a doubt, the safest way to get your books published is to self-publish using major online book retailers that offer self-publishing platforms or to use an ebook aggregator. If you only publish ebooks, then Amazon KDP plus your choice of an aggregator is all you need. By self-publishing in this way, you are in full control, and you will be paid the highest royalty rate. The other safe way is to try to get published by a traditional publishing house. Outside of the first three options, the publishing industry becomes more difficult to judge. Take care if you wish to sign with a small press publisher or use an assisted-self-publishing service and do your research and checking before you commit yourself. Be careful also if you receive an unsolicited offer to publish your book. Whenever you think something is too good to be true, it almost always is. Lastly, avoid vanity publishing, or at least know what you are getting yourself into and how much it will cost you in the end. It is usually a lot of money with no guarantee at all of any book sales.